Werfenweng is a village in the Pongau area of Salzburg, more specifically in the Tennengebirge area. 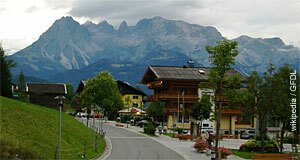 It has a population of approximately 900 and is well-known as a hiking and skiing destination. That being said, note that Werfenweng is not as touristy as the hot-spots of skiing tourism in the south of the province. For that, Werfenweng is too far north. The skiing area of Werfenweng includes some 25 kilometres of slopes and extends between altitudes between 1,000 and 1,900 metres. The local skiing culture is being honoured and celebrated with a museum on skiing, the Schimuseum Werfenweng. During the summer season, there are plenty of opportunities to explore the surrounding mountains of the Hagengebirge, Tennengebirge and other mountain ranges. In the immediate vicinity of Werfenweng, you will also find several Almen, the traditional mountain cabins used for accessing Alpine pastures and now often run as inns. Today, many of them are not lucrative agricultures anymore and the grazing cows serve primarily to maintain a certain kind of landscape and as a justification for receiving agricultural subsidies. Nevertheless, the value of Almen for tourism is very high and they make rewarding supplements to "ordinary" hiking around Werfenweng. Note for example the Mahdegg-Alm (1,200 metres), the Samerhof, the Elmaualm (1,520 metres), the Werfener Hütte (1,969 metres), the Wengerau, the Dr.-Heinrich-Hackel-Hütte (1,530 metres), the mountains of Tauernkogel (2,247 metres) and Eiskogel (2,321 metres), the Anton-Proksch-Haus (1,590 metres), the Freilassinger Hütte (1,550 metres), the Zaglau with a cable car to mount Bischlinghöhe (1,835 metres), the Strussing-Alm, the Bischlingalm and the Sonnwendhof.